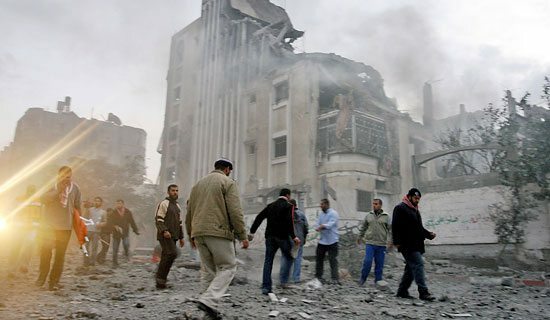 The National Lawyers Guild (NLG) condemns Israel ‘s massive bombardment of the Gaza Strip which has left over 300 dead and 1,400 wounded, with the tolls mounting. The Israeli Air Force dropped more than 100 bombs in dozens of locations throughout the Gaza Strip as children left school on Saturday. The dead include men, women and children in school uniforms. “International law forbids the targeting of civilians,” said Radhika Sainath, a civil rights attorney and member of the Free Gaza Committee of the NLG. ” Israel must comply with laws of war and the Fourth Geneva Convention.” Today’s massacre marks an escalation of Israel ‘s two-year blockade of the Strip which has deprived 1.5 million Palestinians of necessary food, medicine, fuel and other necessities. In November 2008, the United Nations stated that it had run out of food to feed over 750,000 needy Gazans. Israeli military spokesman Avi Benayahu stated that the Israeli bombardment of Gaza was “only just the beginning,” showing utter contempt for international norms and the lives of innocent Palestinians. The Guild calls on the entire international community, and the United States in particular, to demand an end to Israel ‘s blockade of the Occupied Territories and its murderous assault on the Palestinian people. We urge everyone to join in the demonstrations planned across the country in opposition to this latest attack on the rule of law by Israel and we call on both sides to immediately reinstate the cease fire. Founded in 1937 as an alternative to the American Bar Association, which did not admit people of color, the National Lawyers Guild is the oldest and largest public interest/human rights bar organization in the United States . Its headquarters are in New York and it has chapters in every state. To Protest the Israeli Carnage against the Palestinian people of Gaza. How Ignorant! We are talking about GODS land! Why don’t you IDIOTS take a few minutes and open a BIBLE? I can’t believe your stupidity! Stop your STUPIDITY,Get out of your ignorance and have a reality check! Read the friggin book To SAVE YOUR SOUL!!!! It just totally BLOWS my mind that some of you just don’t get IT! I WILL pray for your LOST souls! I DO Pray for all of you uneducated lost souls. OH ISREAL the land of GOD will have reign above ALL nations. So It Is written. So let it be done. Whoa! What kool-aid have you been drinking, Mary? If there is a god, he or she would certainly NOT prefer one small frigging desert over the remainder of the globe. Besides, there’s too much proof that the human race started in the mountains of what’s now Ethiopia. Don’t pray too hard for me or the other lost souls Mary. Heaven would get so crowded that the truly pious might just wanna blast us heathens straight back to hell. Oh, wait…. Being Jewish and having grown up in a New Jersey community that resembles a modern-day Babel, I have always held my views on relgion (and indirectly, Israel) to be representative of my humanity and not my background. Lest we forget that Israel was created in 1948 by the United Nations as a place of refuge for Jews worldwide trying to pick up their lives after the Holocaust. My mother lost 16 aunts and uncles in the Holocaust along with countless other family members that she or I will never meet because of the fascist nationalism that gripped Germany over the course of one decade. Of course, over the last 50 + years, it seems that hard line political factions in Israel (with the support of our own clumsy administrations, save for Jimmy Carter) have been able to pin the world’s debt for the Holocaust and widespread Anti-semitism on Palestinians living on land no bigger than San Diego County. As a pacifist, I think this and other attacks on the occupied territories of the West Bank and Gaza are atrocious offenses that have left the world no choice but to label Israel as a country adept at covering up human rights violations. The current invasion, clearly a massacre more than anything else, will make this conflict a more sordid affair than in years past. As a Jew at Sunday School, I was taught by some religious folk that living outside of Israel meant that I was living as a quasi-expat in a worldwide diaspora, and that support of Israel by Americans was imperative to its survival. As technology and media have changed the global perception of Israel from a land of refuge to a bullying occupier, it has become more apparent to me and other Jews who have grown up with a close connection to the atrocities of WWII that many of the actions performed by the Israeli military are mirror images of the SS and Gestapo of the Nazi army. In college I joined a group of kindred spirits calling itself “Students for a Just Peace”; it was here that I learned that religious background and conviction has nothing to do with this conflict. While I am not myself a practicing or observant Jew, I am keenly aware that there are many who are that are against the occupation in any form. Groups such as the International Solidarity Movement have at times been heavily populated by Israeli citizens, and there is an increasing global understanding that more violence is simply not going to cure any of the ills that plague Israel and the Occupied Territories. I am glad that Barack Obama has not made a blanket statement about the most recent violence, as I hope our President elect is able to understand the complexity and fragility of this situation. This is no longer a war between two factions; it is a massacre under the guise of security, and the more bodies that are found, the more the fires will be stoked. It is reprehensible to me that politicians, Christian Evangelists, and Jewish leaders in America and in Israel would promote the IDF’s actions as necessary. If Jesus or God were able to make a statment to the media like the one President Bush made, I highly doubt that he/she/whatever would praise Israel or any other government for taking military action to solve a conflict. It is my understanding that religion promotes Peace, tolerance, forgiveness, etc. In Judaism, the basis of religious practice is called Tikkun Olam, which roughly translates to “repairing the world” or “healing the world”. I can only see further destruction at the current rate, and it literally paralyzes my faith in the peace process. When will it end? Older Article: A.G. Jerry Brown’s reversal on Prop 8: Politically courageous act of the year?